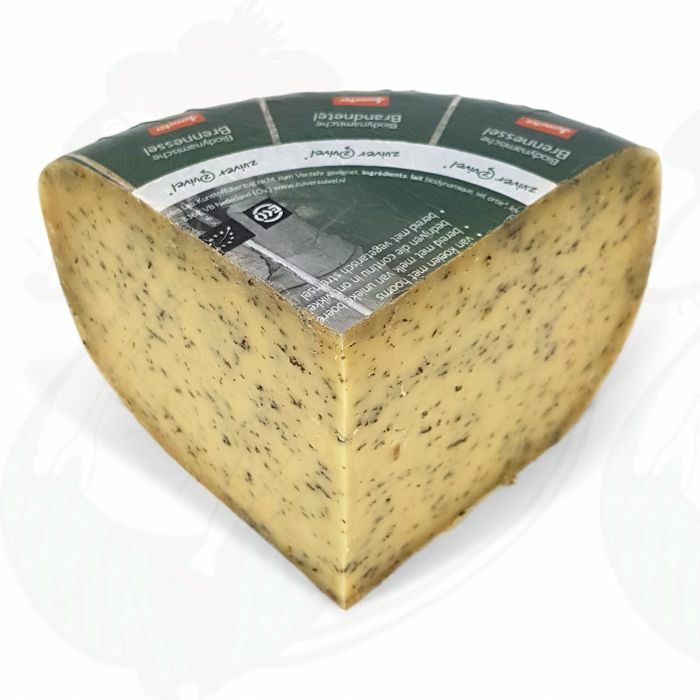 This biodynamic nettle cheese from Weerribben Zuivel has a creamy, fresh and spicy taste which has been attained by adding tops of stinging nettle leaf. This soft and tasty cheese tastes delicious in a sandwich but is also very tasty as a snack or to add to a salad, for example. This extra quality cheese is made using vegetarian rennet, making it suitable for vegetarians. To preserve the quality of the cheese, store it in a cool place where the temperature is no higher than 7 degrees Celsius. The Demeter quality mark means that this product is of top quality. You get a pure cheese that is very full of flavour, and at the same time you contribute to a better environment. This cheese contains no traces of wheat, gluten, peanuts, nuts, soy, egg, celery, mustard, sulphite, lupine or sesame.